The image captures the essence of these two characters to perfection. In short ... this is AWESOME! This is truly amazing! I like the fish nets on X-23's top. Really dope looking. And...is there any chance of you making the drawing into bigger resolution? I'd love to see this bigger! thanks, you can hit the download button for a bigger version. or did you mean larger than 1243×900pixels? Love your art ,cool gallery by the way ! ...Who's the girl? I don't recognize her... But excellent job! 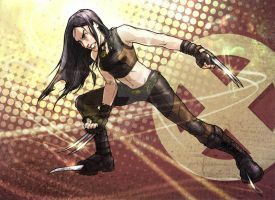 short aswer... she's wolverines sister, X-23. yeah, i found out much more about her since drawing this. at the time, i'd only seen her once. and felt like drawing her. but i really enjoy her character now. Well great! Always nice to meet another X-23 fan. I see... Unfortunately, I'm rather uneducated in the realm of X-Men. Very good piece, by the way. I love your artwork. Hee hee, well, I love your picture of her, anyway. The dynamic between her and Wolverine is excellent. A cold Beer(Wolverine) and a Beer & Tab(X-23) bar keep.